The lobby bar at the Best Western Plus Bristol Hotel is a real gem, located along the entire length of the hotel with access to the reception and the business center, and as well – a direct view to the lively boulevard outside. The wide windows create a sensation of spaciousness and depth, and the elegant upholstered pieces of dark-leather furniture and the wood-and-glass tables highlight the stylish and luxurious design of the bar. One of the accents in the interior is the original arcade with concealed lighting and two-type floor tiles of superior granite - a bold and attractive designer solution. 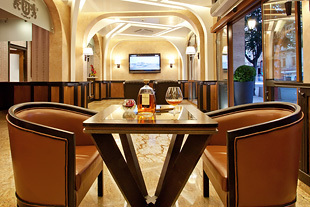 The lobby bar is ideal for an awakening dark morning coffee or cocktails in the evening for a complete relaxation with the night lights as a background. Guests can enjoy a wide selection of fine cognacs Premium, quality brands of whiskey and aged wines, served with appropriate exotic nuts and irresistible sweets. The capacity of the bar comprises of 20 seats and is suitable for business meetings, informal communication or just a good start of a brand-new successful day.